Jonah, my three-year-old son, LOVES Lightning McQueen from the Disney Pixar movie Cars. 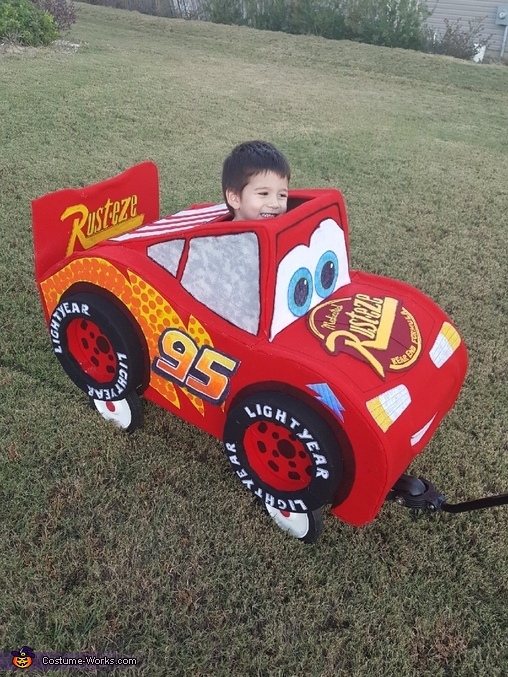 I set out for inspiration online and came across an incredible rendition of a toddler-sized Lightning McQueen! I knew as soon as I laid eyes on it that I wanted to attempt my own. His base is made from cardboard found behind Walmart. Thank you, Walmart, BTW! I drew and cut out the sides, made tubes for the inner skeleton, and connected all that with hot glue. I curved the top layer of his body by rolling it around the duct tape roll, and hot glued that on the sides/skeleton. Then I proceeded to draw, cut out, and glue on the spoiler. The last cardboard task was the cockpit which I drew, cut out, and attached the same way. After his body was together, I made the mouth, and began to glue on red felt with spray adhesive. Lighting McQueen's eyes, headlights, Rust-eze sticker and logo, windows, lightning bolts, 95's, brake lights, etc are all hand made by eyeballing original stickers from photos online and drawing and cutting out with felt. I went through an entire can of spray adhesive putting on all that felt! The wheels are made from foam rings and covered in, yet again, felt! I attached them to Lightning's body with hot glue. Great job Andi love you! great job! best costume I've seen yet!